What Is the Difference Between Living in Dorms & Being in a Sorority? Dorm costs are sometimes more expensive than sorority house fees. When you join a sorority, a key consideration is whether to live in a school dorm or in a sorority house. Some colleges don't have Greek housing, so your options are limited. Sororities also have different requirements. Some require all members to live in-house, while others restrict housing to upperclassmen. If you do have a choice, understanding the differences helps you make the right one. Costs vary by college and house. In some cases, living in a sorority house is more expensive, but often dorm life is more expensive. At UCLA, sorority members pay $7,650 for "live-in" fees as of 2013, which include dues, room and board. If you live in a dorm, you pay a "live-out" fee of $2,162 for housing and dues. As a comparison, the school's Greek housing page indicates typical residence hall room and board fees are $12,792 for nine months. Your personal space is likely very similar in a dorm or sorority house. A dorm is a relatively small room that you normally share with one other student. You get part of the room for your bed, desk and minimal personal closet space. Shared space is usually small. A sorority house typically holds 15 to 50 sisters. You will likely share a room with at least one other person and your personal space isn't much different. However, the shared living space is much larger in a house. You typically have a kitchen, living room and game areas, multiple bathrooms and some outdoor recreation space. Naturally, your closeness to other sisters is greater if you live with them. Of course, you may experience more rifts and tension as well. 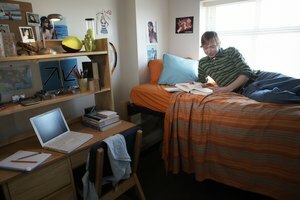 Some colleges require all freshman, and sometimes sophomores, to live in residence halls. This approach puts greater priority on campus community life versus sorority life. If you want a mix of sorority and non-sorority relationships, this requirement is beneficial. As you advance in school, you might want more closeness to sisters, especially upperclassmen. Some houses require that you live-in your last year or two. Living in a dorm usually gives you greater exposure to campus-wide activities and the culture. Living in a house can lead to tighter bonds with sisters, but the formal and informal requirements may preclude your involvement and relationships with others outside the sorority. Sharing space with one other person is also different than sharing a house with 15 to 50 people. You have many more people's personalities and habits to adjust to. You should also consider house rules, the sorority's culture and whether your values align well with the sorority. If you don't drink, for instance, you might have a hard time in a house that allows of-age students to drink. Many schools and houses are dry, though. Ball State University: Do Fraternities and Sororities Provide Housing? Kokemuller, Neil. "What Is the Difference Between Living in Dorms & Being in a Sorority?" Synonym, https://classroom.synonym.com/difference-between-living-dorms-being-sorority-5729.html. Accessed 18 April 2019.